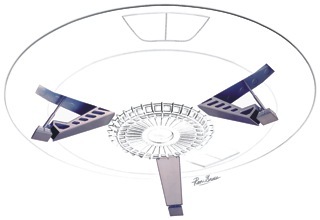 Based on decades of research by noted Jupiter 2 expert and artist Ron Gross, this multimedia add-on set duplicates the landing gear used for the 4 foot "hero" landing gear. Including cast brass & resin and laser-cut acrylic pieces, this easy-to-assemble set provides the ultimate in authenticity. Please note that the instructions that went out with the first run of landing gears had parts 11 & 12 reversed on the fret layout. This has been corrected for future versions of the instructions, including those posted on this site. Please note that due to weight this item ships via Priority Mail within the US. We can combine shipping with other standard rate items, though our shopping cart doesn't handle this automatically. We will refund any shipping overage or send a separate PayPal invoice for required additional shipping. International shipments will be invoiced separately for International Priority shipping. We appologize for the inconvenience.